This winter has been a long wintery swamp of prep, what with the arm not wanting to hold anything still for any length of time and all. 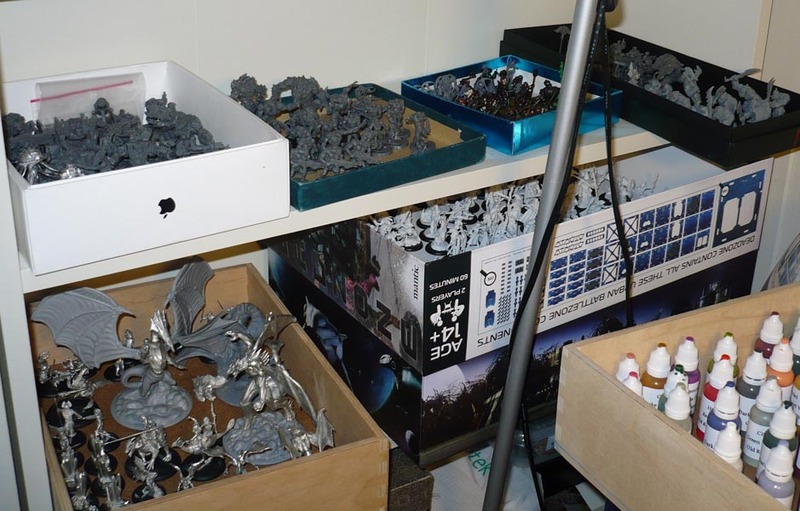 Also several kickstarters have started delivering product, flooding me with lots and lots of miniatures to prep, and far too much to choose from… what little time I have had to spare has been spent sifting through all the goodies and subsequent masses and masses of prepwork. so there has not been a lot painting being done. The shelf of already prepped, what is waiting to be sprayed in springtime. With all the new stuff arriving, I will soon be needing another shelf. The Black Metal outfit I originally intended was, well, too Black. 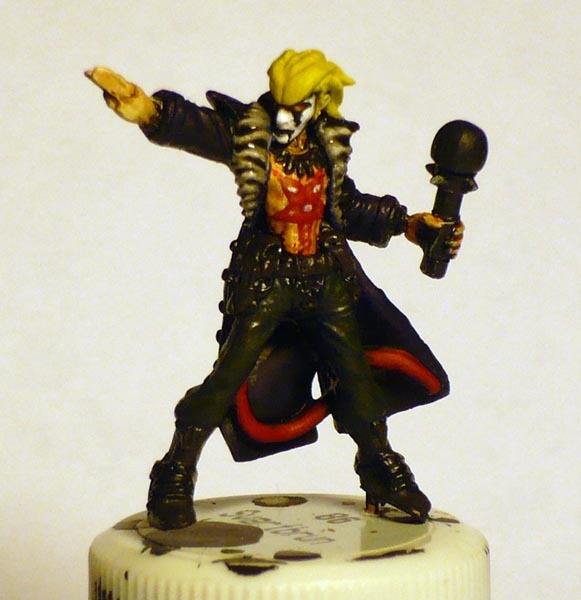 So I have used some colour with black washes to darken them, He is stil blackish, but not monochrome. Next up…spikes and metal plates! I have also decided to make a custom base, using a base stamp for the first time. Therefore I have pinned him to an old paint pot for handling while painting. Also a first for me, but definately not the last! That made it so much easier to hold the mini. The second thing I did to break the swamp of prep, was to do a large unit of something really easily and quickly painted, so as to get some sense of accomplishment. 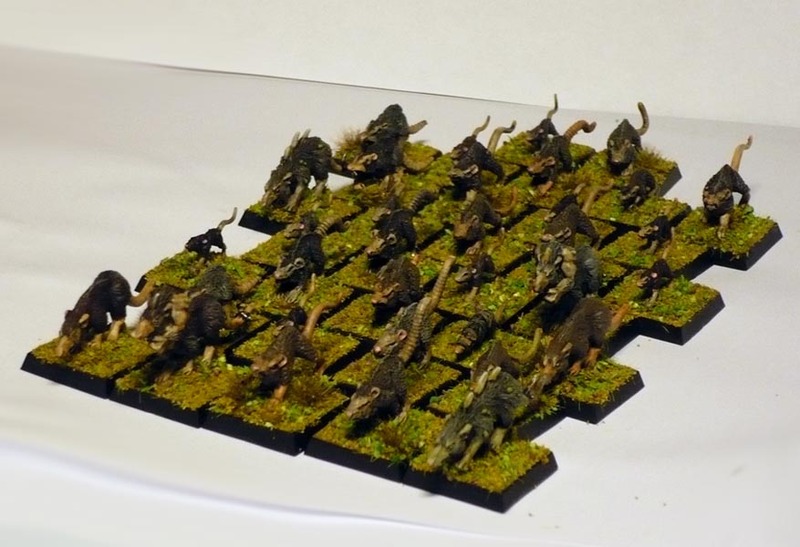 The choice fell on a block of giant rats for my skaven horde. 34 of the little blighters to be precise. The lot of them took only a few hours all together. Bones made of Bones. Bendy little blighters. I also painted each one with a different colour combo just to see how they turned out. the picture doesnt really show that. The thin Bones are really bendy. 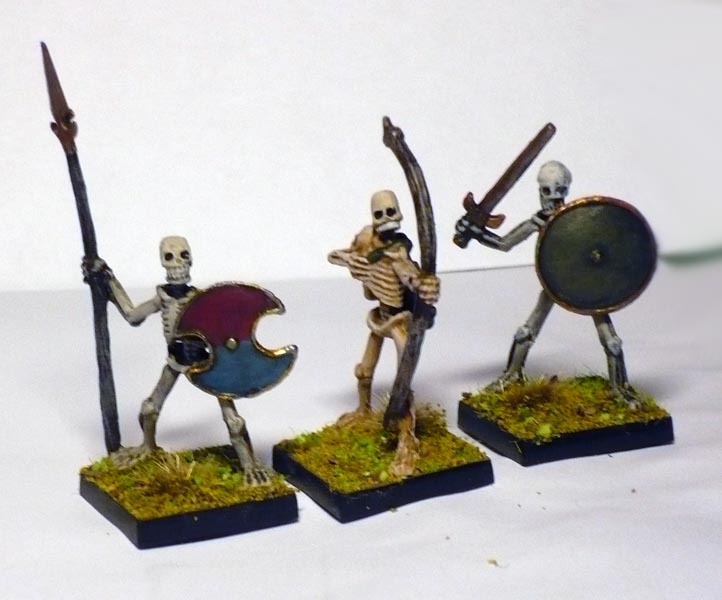 Which makes them a bit difficult to drybrush. Also the details are quite soft, especially in the faces. So they end up getting a slop’n’go paint job. They will probably get hidden in some unit anyway. Fourth, this one is some weeks since I did. Another slop’n’go (many of those lately) with a reaper bones ghast (or whatever) and two mantic Ghouls bringing up the rear. 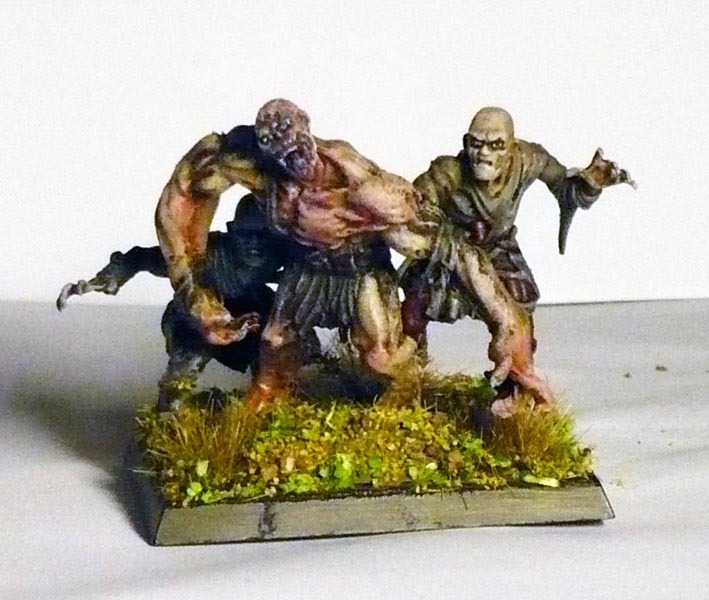 This is intended as a rank-filler in a large unit of ghouls or zombies. PreviousThe first Drake: the Dragon Wargame shipment has arrived!